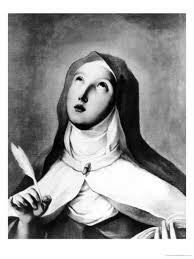 Teresa of Ávila (1515—1582) is a mystic who was born in Spain, and entered a Carmelite convent at age eighteen. Her important writings include The Interior Castle, and The Way of Perfection. She was an influential reformer of the Carmelite Order, and is considered — along with John of the Cross — to have founded the Discalced Carmelites. She promoted strict rules including ceremonial flagellation and nuns remaining barefoot. She established several monasteries which promoted vows of poverty. Teresa is said to have at times, beyond her own control, levitated about a foot and a half off the ground as she was going through her raptures.